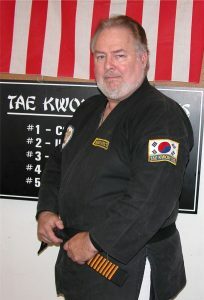 Over 40 years experience in the Martial Arts. Studied and received Black Belt under Master Myung Kim-8th Dan Chang Moo Kwan of the Korean TaeKwonDo Association. 5th Dan Black Belt Nippon Shiho Karano Ryu Ju-Jjitsu. Moku Roku License in Shiho Karano Iaido (Way of the Sword). 5th Dan Black Belt Bong Sool (short and long staff).